Late spring in North Texas brings with it warmer nights, more thunderstorms, and, alas, mosquitoes. Many, many mosquitoes. Some bite during the day, others bite at dawn and dusk. We all cover up in long sleeves and douse ourselves in whatever promises to keep the critters from feasting on us, but the welts show up just the same. Given the continued threat in the area of mosquito-borne diseases such as West Nile, St. Louis encephalitis, dengue, and chikungunya, and the possibility of Zika, we’re on even higher alert. Most of these diseases can be deadly, and Zika’s correlation with microcephaly makes it doubly dangerous. We have repellants that work, and most cities around here spray regularly for mosquitoes. But we have to ask ourselves, is it enough? One solution that looks promising has already been implemented in Brazil, where the outbreak has already caused significant harm. Earlier this year, NPR reported on Oxitech, a British company that released genetically-modified male mosquitoes whose offspring die before adulthood. This has led to a reduction in the population of the mosquitoes that carry the Zika virus. If it worked in Brazil, why not bring the solution here? In a phrase: genetically modified organisms, or GMOs. To many, the phrase evokes associations with scary possibilities, but studies point to the general safety of GMOs. According to an article in The Guardian, the World Health Organization encouraged the use of GMO mosquitoes to combat the virus, though more research is needed. In this situation, the benefits outweigh the known risks. So what does this have to do with science fiction? I think the way this story is unfolding bears examination. 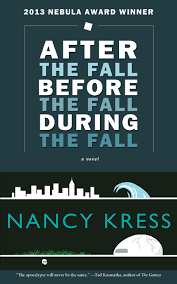 Recently, I read Nancy Kress‘ Nebula Award winning novella After the Fall, Before the Fall, During the Fall, and I think it provides a useful metaphor for the way lay people see technology. In the novella, life on earth has been all but destroyed, and only a handful of people remain in the protective Shell, a habitat provided to them by aliens they call the Tesslies. The people suspect the Tesslies destroyed most life on earth and are now keeping them in the Shell and providing them with technology to live and to regenerate the human population for devious purposes. But in fact Earth, in essence, destroyed life to save itself. The Tesslies saved those whom they could, and sheltered them until the environment was suitable for human life again. We see the Tesslies through fifteen-year old Pete’s eyes as a sort of “black box”: he doesn’t know if the metal outer casing of the one Tesslie he encounters houses a robot or a living being. His life, and that of all of those in the Shell, is hardly a happy one; it’s one of monotony and hardship, and he lacks true companionship. All of this, he thinks, is the fault of the Tesslies. Thoughts of revenge consume him until he learns the truth about the Tesslies’ intentions. They do far more good than harm, even if they are, to him and the other people, unknowable. While aliens are not going to come down and exterminate all mosquitoes from Earth—though we can hope, can’t we?—we can take a lesson from Kress’ story. Time is short, mosquitoes are here, and they may begin to carry Zika in the U.S. before we know it. The GMO technology exists for combating the Aedes aegypti mosquito. Now, we just need to find a way to tell the story of the GMO mosquitoes that pushes people past their beliefs that it will cause more harm than good.